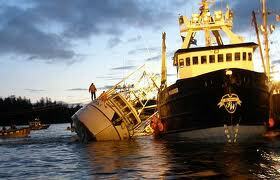 The past few postings here on PickFish Tales, I've featured fellow Fisher Poets. Well, I've enjoyed riding that wave so much and decided to ride it a little longer. This week's blog high liner is Pat Dixon. 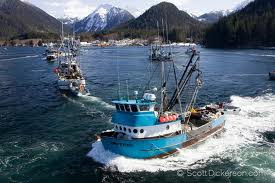 In the Tote is a culmination of musings, writings, songs, tall tales and of course, stories of the one that got away from folks in the commercial fishing industry. From fresh greenhorns to salty skippers, Pat has schooled up stories from across the country of sea faring men and women who make the annual run to Astoria's Fisher Poets Gathering (FPG), this year in its 16th year. 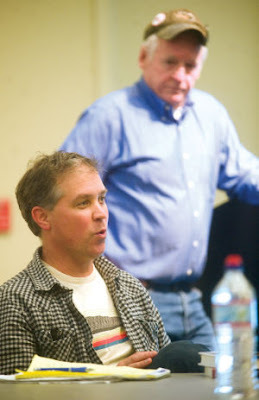 On the site, which Pat just recreated, you'll find audio files, video, photos and writings of 36 Fisher Poets, myself included, who have one time or another, performed on the stages at the FPG. As Pat states on the welcome page of In the Tote, " The material you read and listen to here represents a small fillet of what has been caught at the Fisher Poets Gathering.....since it began in 1998." WORD OF WARNING: listening to sea stories can be highly addictive and has been linked to longings for the ocean, the feel of wind in your hair and salt spray on your face. 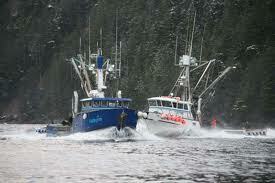 Eating wild salmon has been known to help. However, if gone unchecked, it can result in the insatiable desire to fish commercially, which, as of the date of this writing, there is no known cure. 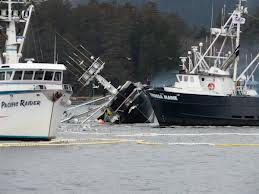 If you find this happening to you, please join your fellow salty sufferers at the 2014 Fisher Poets Gathering in Astoria, Oregon from February 21-23. I'm out. 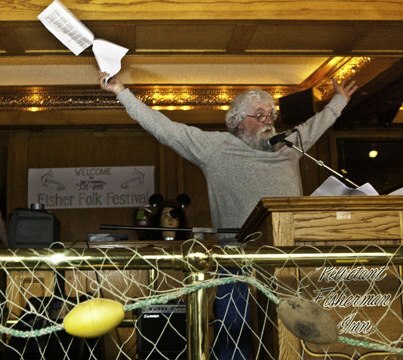 As most of you know, a few weeks ago I was the 16th Annual Fisher Poets Gathering in Astoria, Oregon. It was a fabulous time! Its so great to see old friends and meet new ones. This year, I emceed one evening with my buddy Lloyd. It was my first time as MC and one thing I liked about it was that while I usually run around venue to venue chasing radio fish, as MC I had to stay put. As a result, I caught acts of folks I hadn't heard of and never would have checked out. Phil Lancing, for example. He memorized his entire 15 minute story that was quite good and funny! He is a hoot! And speaking of being a hoot, that brings me to fellow Fisher Poet Dennis McGuire. He is a character, to say the least. Some of his poems and stories are pretty outrageous, but by just looking at Dennis, you know they are true. 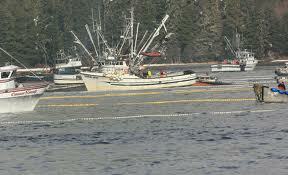 He is a long time fishermen on the Copper River Flats out of Cordova Alaska and well seasoned at Fisher Poets. 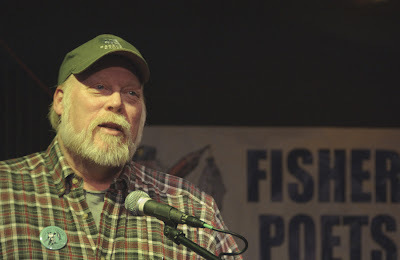 Below is a photo of him a few years back at Cordova's In 'Em Fisher Folk Festival. We gotta do something about this nightmare. 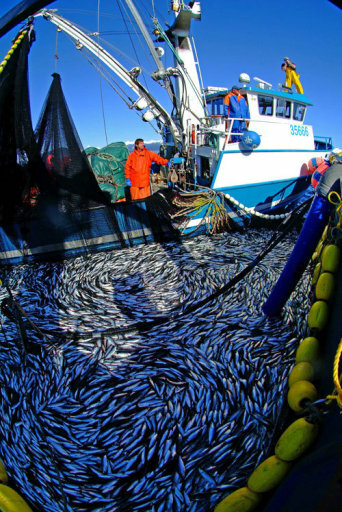 Join me in signing these petitions to stop yet another threat to our fishery, our jobs, our livelihood, and most importantly, our food! Please join me in saying NO to Frankenfish! This week, I thought I would shake things up a bit and invite John Copp here on PickFish Tales to bend your ear about Pebble Mine in Bristol Bay Alaska. 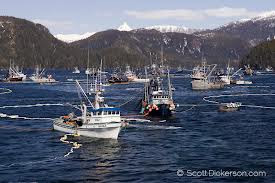 John is a fellow Fisher Poet and commercial fisherman who fished Bristol Bay, Alaska for alotta years. And he's got something to say about the proposed mine. generates ten billion tons of material so toxic that it destroys every living thing in a ten square mile radius,not just today, but for the next thousand years. No, this isn't a science fiction movie. 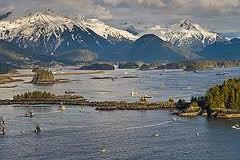 It's Pebble Mine. If allowed to be built, say goodbye to the last great wild fishery left, Bristol Bay, Alaska. 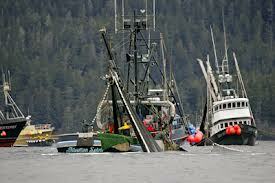 A highlight of the 2013 Fisher Poets Gathering in Astoria, Oregon, was a Pebble Mine panel. 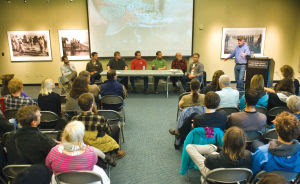 Panelists included an environmental attorney, fisheries biologists from the University of Washington and Oregon State University, an historian with a social conscience, a successful author who illustrated the dangers from copper mines in his recent book (Boom, Bust, Boom), and two politically active young fishermen.The panel provided fact-based arguments, a solid understanding of the threat to the fisheries, and a clear grasp of how existing law can be applied. The room was packed, and the audience was keenly interested and full of important questions. Most importantly, the panel gave hope that we can save Bristol Bay. 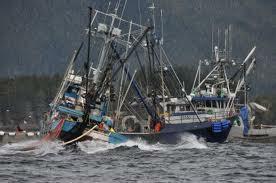 fishermen (and the hundreds of Oregonians who work for them) bring home over $10 million dollars each season. 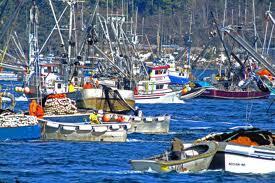 That doesn't include revenue from crab, herring, and guiding sport fishermen. 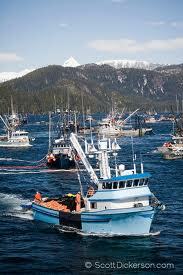 Fishermen from Alaska, California, and Washington earn far more. 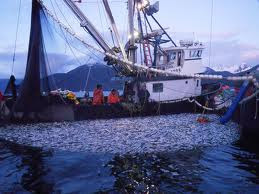 Panelists agreed on a key point: large scale open-pit mining CAN NOT COEXIST with wild fisheries. The reason that Bristol Bay is so bountiful is water. Clear, pure water, running wild and free. Pebble's infrastructure alone will massively damage the water. 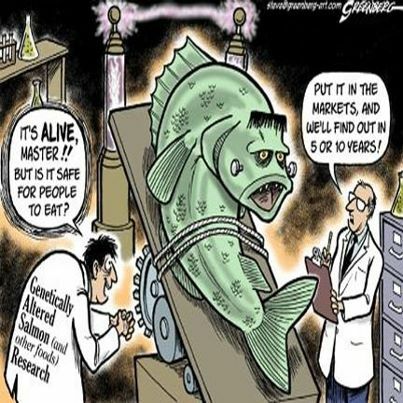 Not only will it use massive amounts, it will insert toxins throughout the ecosystem. 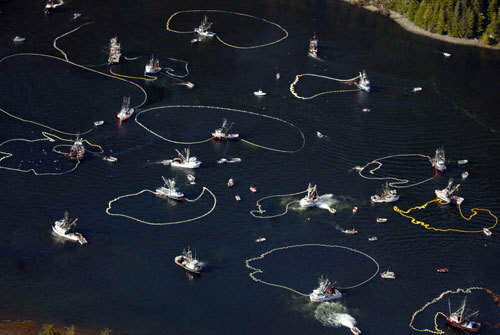 Study after study has shown the negative impact of toxic metals and acids on salmon biology. It doesn't take much. done on Bristol Bay. Pressure exerted by Congress and the Senate on the White House will be key. That in turn will depend up pressure exerted by individual citizens on their State Representatives. The miners have deep pockets and are lobbying politicians day and night. Time is running act. 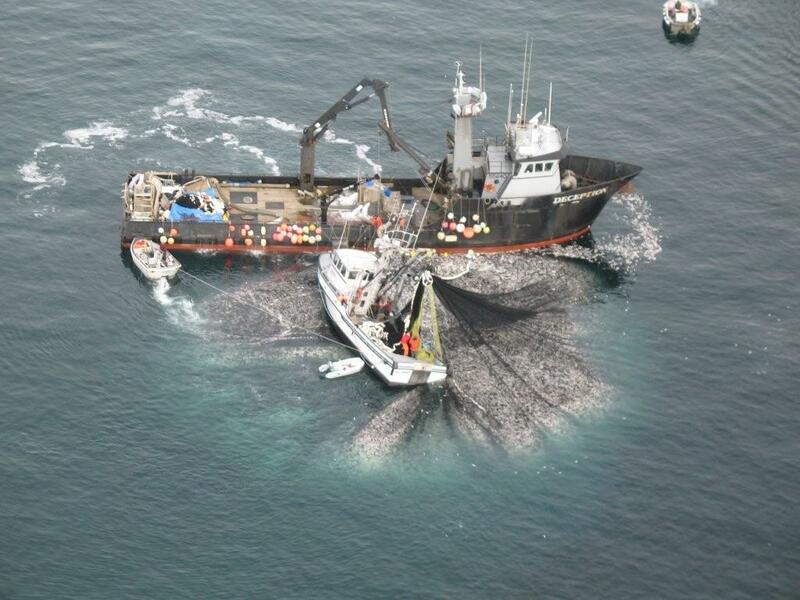 If you, dear reader, care two cents about saving Bristol Bay, TAKE ACTION. Contact your Representatives, President Obama, and the EPA. 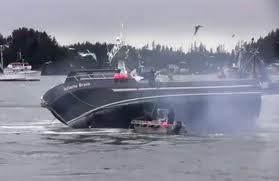 Donate a few bucks to groups leading the fight against Pebble, including Natural Resource Defense Council, Trout Unlimited, and Fishermen for Bristol Bay. 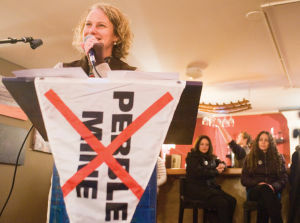 More information about the panelist can be found in the The Daily Astorian article that came out Tuesday, February 26th: http://www.dailyastorian.com/free/pebble-mine-opponents-gather-during-fisherpoets-event/article_24334862-8049-11e2-bb1b-0019bb2963f4.html. They even got a photo of yours truly at Clemente's Restaurant, who is also against the mine. As John stated, TAKE ACTION! Contact your Representatives, President Obama, and the EPA. Donate to groups leading the fight against Pebble Mine, including Natural Resource Defense Council, (http://www.nrdc.org/) Trout Unlimited, ( http://www.tu.org/), Fishermen for Bristol Bay (http://fishermenforbristolbay.org/), and Stop Pebble Mine (http://www.stoppebblemine.org/).